This little guy enrolled in one of the two bilingual PreK Classrooms on an Early Childhood Campus and was referred for assessment by his teacher and mother. 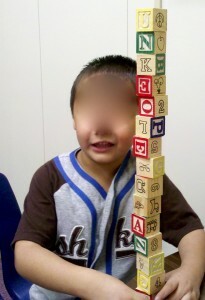 My play-based early childhood assessment team (educational diagnostician, school nurse, school psychologist, bilingual PreK teacher, Special Education Teacher, Speech Therapist, Occupational Therapist, Physical Therapist) spent no telling how many hours during his PreK school year trying to figure out what was up with him. Just about the time we’d gotten him all figured out, the school year was over and it was time to send him to big school, an elementary campus! Three months into the fall semester Mrs. C asked me to come take a look at Andy. “I still can’t tell what language he speaks,” she said. She also noted that he was all over the place, that he sometimes hurt the other kids, but not maliciously as far as she could tell, and that she was thinking maybe autism because “it’s become an epidemic since I first started teaching.” She gave me a stern look when she spoke those last words, as if she had her suspicions that our district’s autism epidemic had been caused by me, the only diagnostician specializing in early childhood assessments that our rural district located just south of San Antonio had ever had. “I’m just riding the wave,” I said. I had no idea what was going on either. Back when I’d been in grad school, when we got to the Autism chapter in our Abnormal Psych textbook, the professor had made this statement: The percentage of individuals with Autism as a handicapping condition is only about one in two thousand, unlikely that most of you will ever see even one case. “Maybe it’s the water?” I speculated. (Our rural district did have a coal-fired power plant) “Or the vaccinations these kids all have to take before they get in school?” (It used to be four or five, now it was thirty-seven!) I had no idea why at least one out of every three or four referrals turned itself into an ASD assessment these days, but it wasn’t because I was out beating the bushes and drumming them up. It’s kind of important to know what language a kid speaks before you try to test him, so the speech therapist on our play-based team sat in the classroom all one morning collecting a language sample. Her observations: mostly Spanglish for spontaneous utterances, which almost never happened, and everything else just echolalia. So we decided to test Andy in Spanglish. We provided instructions in English first, accompanied by demonstrations and gestures, and if that didn’t work we repeated the directions in Spanish using the same demonstrations and gestures. By analyzing that first assessment video, I was able to determine that the language of instruction didn’t make much of a difference. However, by repeating simple directions coupled with demonstrations a minimum of three times, we were able to gain Andy’s compliance. 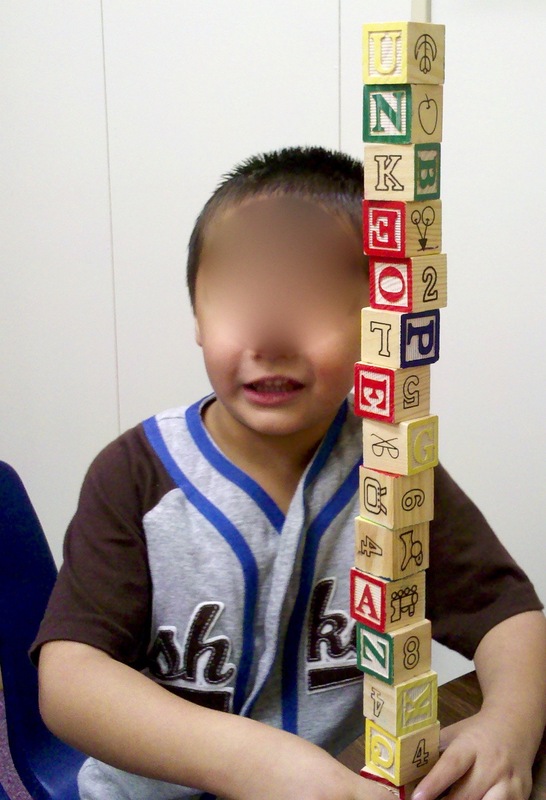 Important modifications that we used (and ones which are difficult if not impossible to provide in a traditional classroom setting) were: Andy needed a task at his developmental level. In other words, when we pulled out the toddler toys, we had no problem getting him to copy what we were doing, and almost always he would repeat our words exactly and intelligibly as long as the utterances consisted of one or two syllable words and were presented in phrases of no more than four words. When we tried to engage him with picture books, letters, numbers, rhyming games, it didn’t matter how we contorted, he just wasn’t going to go there with us. When you’re trying to figure out what’s up with a little guy, it’s important to check out where he or she has been. To this end, I visited the previous day care where I observed that the center was structured and developmentally appropriate with a teacher / student ratio of 1 adult to 8 or 10 children. “We just learned to let him do his own thing. 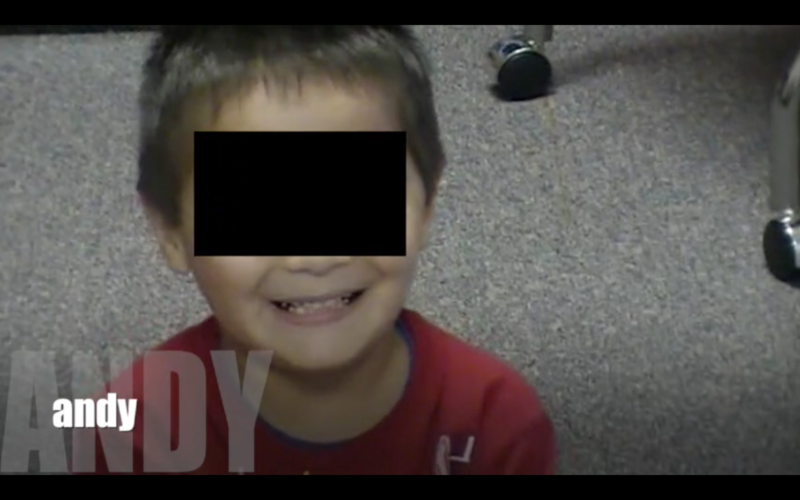 He’s a sweet little boy, doesn’t bother the other children, but he doesn’t copy them either,” stated the teacher. “I’ve never had a kid like him before,” she added. Since he’d been at that same daycare for two years, I ruled out lack of opportunity to learn. “What do you know about the home life?” I asked. “Mom’s nice, she works two jobs, and it’s hard,” she said. I decided that she was being evasive because of how her eyes skittered all over the place, so I pretended not to realize that she was edging me toward the door and plopped myself down in the chair in front of her desk. “Why don’t you sit down?” I invited. “I know you’ve had a long day, this won’t take long.” I was thinking prenatal exposure to substances . . . that sort of thing. Like Mrs. C I’ve had a bit of experience at what I do, and I’ve learned how to be pushy and persistent without getting thrown out of people’s homes or offices. The day care director shot me a this-woman-has-some-sort-of-nerve look, but she sat. “I think Mom is capable,” she responded. “Like here she says he plays well with other kids and is a little show-off, did you see those sorts of behaviors?” I asked. I got the message. “Thanks,” I said. “And by the way, I did meet the dad, right before he got arrested, and if you ask her to tell you about that, she’s gonna cry,” Mrs. Day Care Director informed me. “Oh, I’m not looking to hang anybody,” I said. “We’re just trying to help Andy.” Even to my own ears, my words and voice tone sounded weak and apologetic. And perhaps Mrs. DCD wasn’t my new best friend. From the information that Mom provided during the assessment process, I learned that there were no family members other than Mom in San Antonio, (we don’t know anybody, we keep to ourselves). Mom’s job kept her from visiting at the school, but whenever Mrs. C sent a note home in the backpack asking Mom to please call her on her cell phone number at night, Mom always did so. So I went that route as well and sent home a note with Andy asking Mom to please call me that night. I gave her my cell phone and home number. Sure enough, she called after she put Andy to bed. During the first of about six or seven conversations she and I had, I learned that Dad had been deported to Mexico two years earlier. She and Andy talked to him once a week, but there were problems, and Dad was afraid to cross the border again for fear of imprisonment rather than deportation. Mom, who worked as a clerk, possessed excellent English, and as I had been told, she worked hard. Besides her day job, she cleaned houses at night or on the weekends, taking Andy with her. Eventually I asked Mom about Andy’s twitches and odd jerky movements. “I think he does those things for attention, to make people laugh,” she said. “A bad habit?” she speculated. I’m going to fast forward about two months now, to the conclusions and recommendations section of this story. We’d had our ARD meeting, and qualified Andy for speech therapy. We’d recommended additional evaluation during the coming school year if he continued to lag behind his peers after one year of speech therapy. Our hope was that he was simply a late bloomer, but we all felt as if there was something else there, something that we’d all missed. Our assessment team had determined significant delays in all areas except gross motor development and had come up with strategies that were helping (a bit) in the classroom. Speech therapy had begun, and Andy was actually doing pretty well in the PreK classroom, although this was mainly because his teachers had significantly modified the environment and the curriculum. None of us anticipated that he was going to be capable of succeeding in kindergarten, which was now about six months away, and three of those months were June, July, and August. We’d debated and decided against requesting a neurological assessment because he was actually pretty good at attending to self-initiated tasks, and unless we interrupted him, he’d generally complete an activity. Also, when we did redirect him, he was quite compliant! He just didn’t look like any ADHD kid we’d ever seen. “This changes things,” I said. I pulled out all of my notes and parent info documents, and where we’d asked about surgeries such as P.E. tubes or tonsillectomies, Mom had responded none. I waited until eleven a.m., Mom’s break time, and called her cellphone number. “What happened to his head?” I demanded. This was when I learned that there had been a surgery to remove blood clots in his brain subsequent to a fall from a Wal-Mart shopping cart at age two! “He didn’t lose consciousness, he just vomited. But I took him to the emergency room and they operated and the doctors said he’d be just fine . . . ” Mom said. She sounded apologetic, and I immediately understood what had happened. She’d showed up at the emergency room and they’d suspected child abuse and, in her mind, she’d had to scramble all over the place to keep from getting arrested and losing her child. “Can our nurse talk to the doctor?” I asked. Mom signed the consents we sent home in the backpack and Mrs. S, the nurse, faxed them to the pediatric neurologist and the surgeon. Both of the medical professionals assured her that the brain injury should have no impact upon the child’s learning ability two years down the road. When asked about the twitches, etc, the doctors insisted they’d never heard of them. Mom, when asked, couldn’t quite recall if her son had twitched and jerked prior to the incident/surgery, but she didn’t think so . . . and she hadn’t mentioned the behaviors to the doctors, because, well, they said he was fine, and she thought he was just a little show off. Also, his Dad had left right after that and Andy had been real upset about that . . . This all happened five years ago. On the last day of school, Andy brought a single red rose for each of his two teachers and the two classroom aides. All four of his teachers cried a lot that day, but they generally cry the last day of school. Maybe he’ll be okay, Mrs. C said. “No offense, but what good is more testing going to do?” Mrs. C asked. She had mascara trails running down her cheeks. She wiped her face with one of the fiesta-themed napkins left over from her last day of school party. “I’ll never learn, will I?” she asked. “Either buy waterproof mascara or don’t wear make-up on the last day of school,” she said. “I don’t know what good more testing will do,” I admitted. But I wanted to help, and that was the only idea that had occurred to me. Mrs. C and I stared at each other. “You did your best,” I said. “Yeah and some kids just break your heart . . .” she replied.